Several categories of blueberry bushes are suited to the various climates of the United States. Mature heights within these categories range from 6 to 12 or 15 feet, depending upon the cultivar. Site requirements as well as maintaining a healthy plant--following a regular program of watering and fertilization--ensures vigorous growth and an abundant crop of blueberries. Blueberry bushes can be divided into three main categories: highbush, rabbiteye, and southern highbush blueberries. 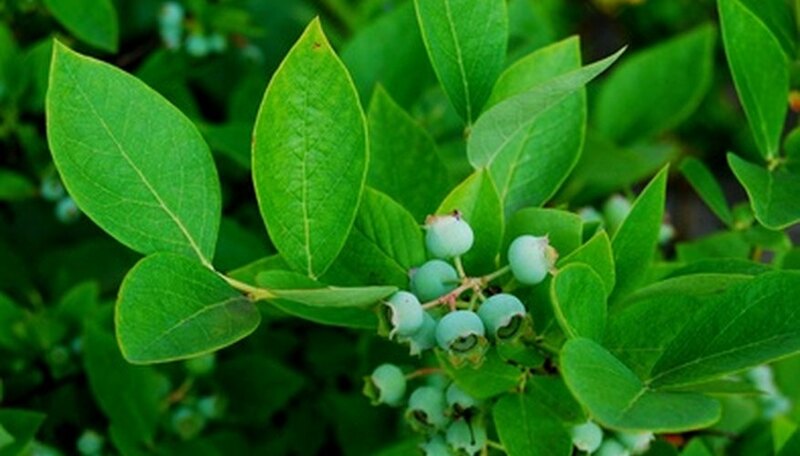 The highbush blueberry shrub, or Vaccinium corymbosum, is native to North America and it is the major cultivar used in commercial blueberry production (more than 50 cultivars have been developed). Southern highbush is a fairly new hybrid cultivar of the highbush blueberry. The rabbiteye blueberry, or Vaccinium ashei, bushes are popular in southern areas of the United States due to their resistance to pest infestation. The height of a mature blueberry bush depends upon the variety of blueberry bush planted. Highbush blueberry bushes generally grow 6 to 12 feet tall. Rabbiteye cultivars, which mature in approximately 10 years, can reach a mature height of up to 15 feet, and a spread of 10 feet. Southern highbush blueberry cultivars, when mature, will reach a height of 4 to 6 feet. Providing the correct environment or habitat for blueberry bushes enables them to grow to their mature heights, and contributes to abundant crops of berries during their lifetime. Highbush and southern highbush blueberry plants require a site in full sun, with well-drained, rich, organic and highly acidic soil with a pH from 4.0 to 5.5. Rabbiteye cultivars require full sun, although they will tolerate partial shade. They prefer sandy, acidic (pH 4.2 to 5.5) soil and will not survive in soil that has a pH above 5.5. Their feeder roots are close to the surface of the soil and also require heavy mulching and moisture management. For maximum growth and productivity, plant the correct cultivar or variety in the recommended growing areas. Highbush blueberries are grown mainly in the Northeast, Midwest, Pacific Northwest and upper southern regions of the United States. The rabbiteye and southern highbush varieties are grown in the southern United States. USDA Plant Hardiness Zones for the rabbiteye are from zone 7 to 9, the southern highbush varieties grow in zones 5 to 9, and the highbush varieties thrive in zones 3 to 7. Mulch all blueberry plants to keep moisture in, control the weeds and to acidify and cool the soil. The mulch should be 3 to 4 inches deep and a circumference of at least 2 feet from the crown of the bush. Fertilization and watering are also important in maintaining a healthy plant. Fertilization differs according to the type of blueberry bush that you plant. Rabbiteye blueberry plants are sensitive to commercial fertilizers, and Texas A & M University suggests that you use only ammonium sulfate or special azalea or camellia fertilizers. Apply them in small, frequent applications. Fertilize highbush varieties with a 10-10-10 fertilizer following the manufacturer’s directions. All blueberry bushes require at least 1 to 2 inches of water a week. Supplemental watering will be required during hot or dry conditions.